Just now, Firdous Cloth Mills winter dresses 2016 for women have been released. Now, it is the perfect time for you to start purchasing of your winter dresses if you haven’t started shopping of your winter outfits so far. Here at this page, you can view the pictures of the dresses of this collection of Firdous Cloth Mills 2016 fall dresses for women. You will find these dresses very beautiful after viewing the pictures of these dresses. You can see in these pictures that there are embroidered shirts in this collection while all the dresses are available in printed form. It is a beautiful collection where unstitched dresses are available. There winter dresses are suitable to be stitched in long and medium length form. All these dresses are perfect for the winter season as you can make a beautiful combination of these shirts with straight cut pants and trousers. In this Firdous Cloth Mills winter dresses 2016-17 for girls, the brand has used the dark and bright colors for its dresses. You can see the range of brown & green, red & blue and purple & pink in all these dresses. 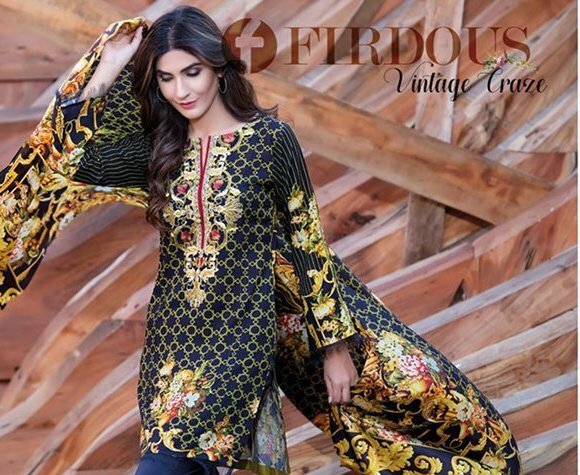 Here below, we are providing complete pictures of the dresses of Firdous Cloth Mills winter dresses 2016-17 so that you can choose your favorite dress for winter season among them. We will inform you about the new collections of this collection line soon after their release by the brand.